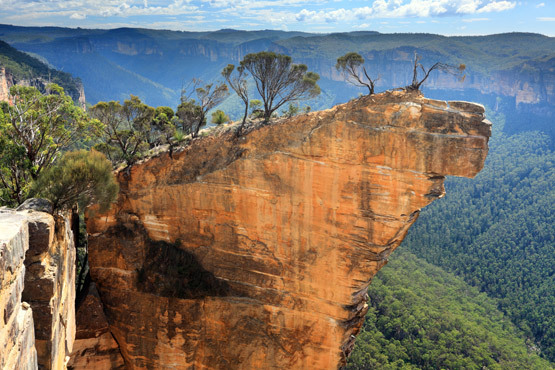 The huge rock formation, the "Three Sisters", is the most famous icon associated with the Blue Mountains, accessible by train or just one hour's drive west of Sydney. 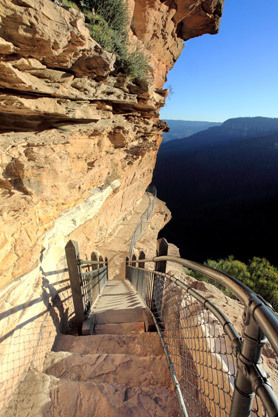 The Blue Mountains is one of the most scenic tourist spots in Australia. 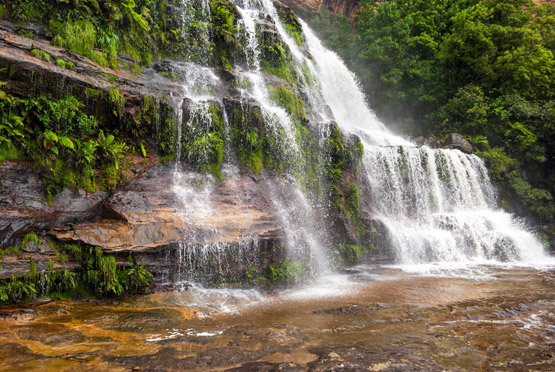 The Blue Mountains, an hour or so west of Sydney either by train, car or coach, is one of the most spectacular tourist destinations in the world. 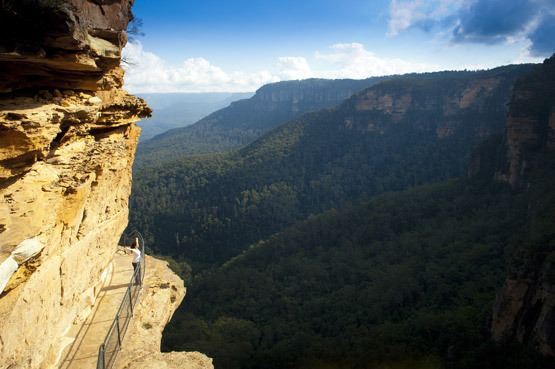 A World Heritage-listed national park, the Blue Mountains embraces 26 townships within the 1433-square-kilometres park. 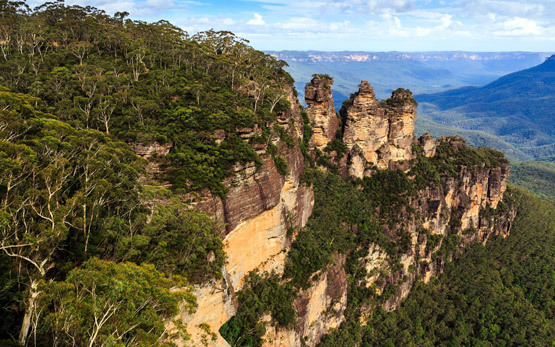 The splendour of the Blue Mountains is best seen at Katoomba, a picturesque town with a population of 8000 about 1000 metres above sea level. Katoomba is home to grand old hotels and other buildings that date back to the 1920s and '30s, when it was a summer retreat for the rich and famous escaping the heatwaves in Sydney. The wealthy would travel on trains to Katoomba and stay at grand hotels like The Carrington. The town sits just two kilometres from the ridge that runs along the escarpment that rises up from the edges of the Jamison Valley. Some of Katoomba's homes can be seen scattered along the top of the escarpment. The main focal point for visitors is Echo Point, where a large tourism complex has been built to give visitors the opportunity to view the mountains from a safe, but spectacular, vantage point. Large viewing areas and a modern visitor information centre and restaurant complex have been built here. 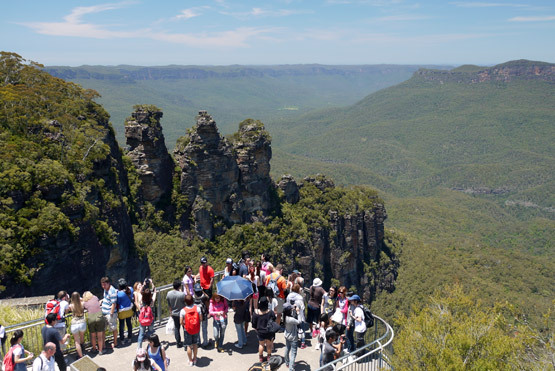 Echo Point offers magnificent views out across the Jamison Valley and Blue Mountains and visitors can admire the famous Three Sisters rock formation and look out onto the expanse of the Blue Mountains and the escarpment that contains the Jamison Valley. The visitor information centre is also a starting point for the walking paths that skirt around the clifftops or snake down the side of the mountain to the valley floor. 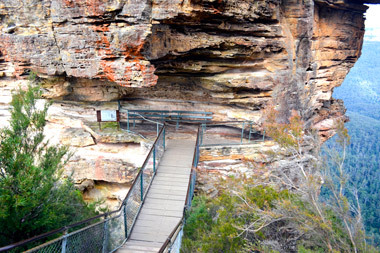 A short walk from Echo Point is the "Giant Stairway", which provides access to nature walks through the valley. Scenic World, to one side of the information centre, is an extensive tourist facility that includes the Katooma Scenic Railway and Scenic Skyway cable car. 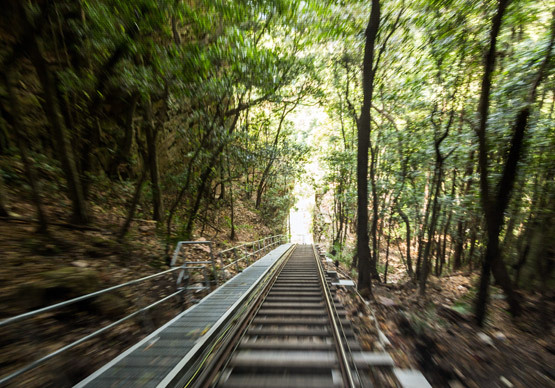 The Scenic Railway is a railway line running almost vertically down the side of a 300-metre cliff. It was originally built as part of coal and oil shale mining operations in the Jamison Valley but now it is used to give tourists a scary ride down the side of a rockface. Passengers sit in an open-caged, roller-coaster-type carriage that drops over the side of the rockface and is lowered almost vertically to the valley floor, 300-metres below. The carriage is lowered and then raised back up by cables and a huge counterweight. This is the steepest funicular railway in the world and a great ride, but not one for the faint-hearted. 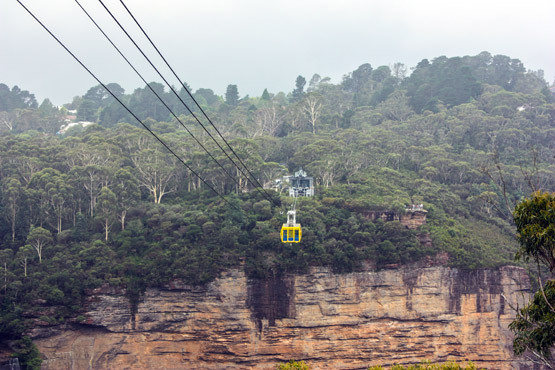 The Scenic Skyway cable car glides on a cable strung across part of the Jamison Valley with views of Katoomba Falls and Orphan Rock. The car has a liquid crystal panel floor, which becomes transparent when the car leaves the Skyway station. Katoomba is also home to other grand hotels like The Carrington, hotels like the Hydro Majestic and Palais Royale. The Carrington, right in the heart of the town, is perhaps the grandest of them all. It enjoyed a recent refurbishment that resurrected the splendour and beauty of the earlier days. It has a wonderful old-world breakfast room and an amazing billiards room. 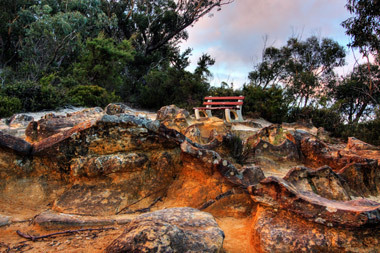 The Blue Mountains was declared a World Heritage park in November 2000. It was nominated for its outstanding natural values, including the biodiversity of its plant and animal communities, its vegetation - which is dominated by Australia's unique eucalypts - and for the beauty of its natural landscapes. The region offers a myriad of activities for the visitor from bush walking, to browsing for antiques, adventuring through lime stone caves, with the Jenolan Caves with its 40 kilometers of multi level passageways as a spectacular example, enjoying the native gardens, travelling on the zig zag railway, taking one of the many Eco Tours or just lazing about one of many tranquil townships dotted throughout the region. 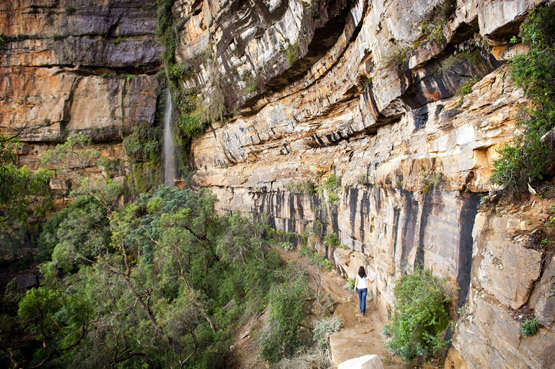 Stay at accommodation within the Blue Mountains at Katoomba, Leura or Wentworth Falls and enjoy early morning scenic walks, breathtaking views and clean crisp fresh mountain air. The "Beyond" in the See Sydney and Beyond Smartvisit Card gives entry to the Norman Lindsay Museum and Gallery, Jenolan Caves, Everglades, Mount Tomah Botanic Gardens and much more. Included in the price is a free guidebook. Tours of the Blue Mountains are many and varied; from a scenic flight in a helicopter to one or two day bus or small group 4WD tours. Explore the sights, scents, feel and sounds of the Australian bush in its most spectacular and beautiful. One of the viewing platforms at Echo Point. This one looks out onto the Three Sisters. 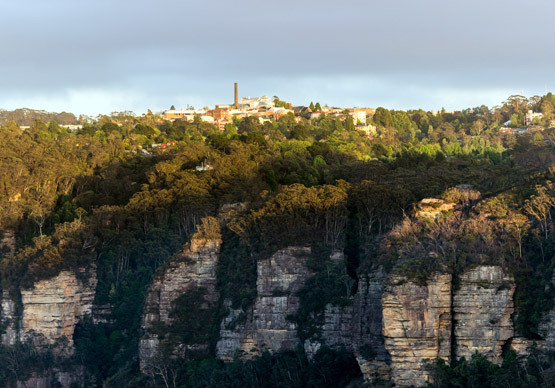 The town of Katoomba can be seen in the distance, back from the escarpment that encompasses the Jamison Valley. Paths along rock ledges lead to amazing views of the valley and mountains. A visitor makes her way along one of the walking paths that lead down into the Jamison Valley. 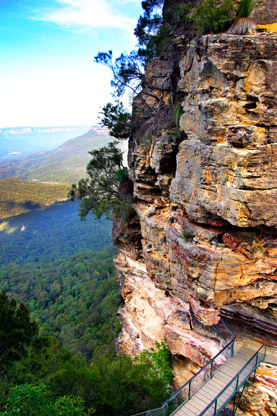 The Scenic Skycar gives visitors spectacular views of Katoomba Falls and Orphan Rock. A seat stands on its own along one of the paths that skirt around the top of the escarpement. Glorious views from here. Following a path around the top of the escarpement you come to a small bridge that takes you onto a viewing platform cut into the side of the first of the Three Sisters. The rails of the "Scenic Railway", a scary ride in a caged carriage that glides almost vertically down the side of a 300-metre cliff. Not for the faint-hearted. One of the exquisitely-coloured rock formations in the Echo Point area. Above and below: Waterfalls are scattered throughout the Jamison Valley. Left: a bridge crosses to a viewing platform cut into the side of one of the Three Sisters. Right: A path leads onto a ledge that snakes around a rockface.